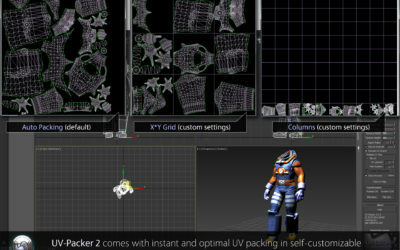 UV-Packer is the ultimate tool for packing UV maps in Autodesk 3ds Max. The ultimate texturing help for any 3D artist’s toolbox! UV-Packer takes all your UV Map parts, calculates their sizes and proportions and distributes them in the most optimal way on the UV panel. Watch our tutorials to learn everything about UV-Packer and how it improves your texturing and UV-mapping. Download our demo version and test it in your production environment. 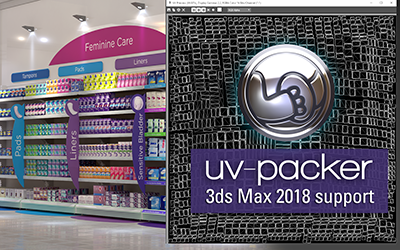 UV-Packer is ready for Autodesk 3ds Max 2018! UV Packer & Unwrella Bundle offer! Get the power of Unwrella and UV-Packer in one amazing bundle! Download a Demo Version and experience first-hand how UV-Packer improves your workflow.